Below you will find our Job Search hints & resources to help you on your way! 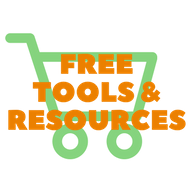 Visit often, as each week a new resource will be added! 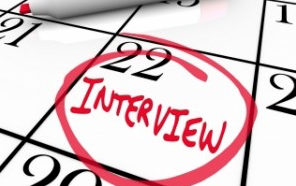 Strategies for success: before, during and after the interview. Whew! Interviews can be stressful, regardless of how well you prepare. Here’s some interview protocol information to help you tackle the stress about interview etiquette and focus on finding out if this is the right job for your CF. If you do not receive an acknowledgment of your resume within a week, you may not receive one. This is especially true for online resume submittals. Don’t be discouraged. If you have reason to believe your resume was not received, you can submit again. Generally, applicant information is kept on file as active for 30-60 days. If it has been longer than 60 days, you can update your resume to better fit the available position and reapply. Sometimes it’s hard to find contact information for the person conducting your interview on a website. Don’t be afraid to pick up the phone and call Human Resources or for the Department, or location site. Let them know that you have an interview for the vacant position and would like to make sure you know where to park and who to ask for when you arrive. Usually, people are happy to help you with basic information like this as we all remember our own pre-interview anxiety. Remember to eat something the morning of the interview! Tell your story in ways that meet the needs of the company – this is what you prepared for! Immediately after the interview, make notes regarding the pros and cons of this position using whatever organizing method you’ve chosen. Make note of any questions you forgot to ask or any missing information to ensure you remember to address it in one of your follow up contacts or in the next phase of the interview. Evaluate your interview experience. Did they help make you feel comfortable and confident? Did you feel they listened to you? How did you feel about how well you would be able to work for and with those who interviewed you? How positive is your opinion of the company post interview? Ask yourself-- is a good option for your CF and if you will learn clinically, grow professionally, and enjoy working there. Say THANK YOU! Between 65% and 80% of all hiring managers report that a thank-you note affects their hiring decision. If you haven’t heard an update after three days, it is appropriate to follow up and request confirmation of receipt of emails or documents sent. If it has been a week since your interview, it is appropriate to ask if there is a timeline for when candidates who are being considered will be notified. If it has been more than a week since the interview (or is after the time frame you were given for when the next interview step would be or when a decision would be made) and you have not yet heard from them, call or email for an update if this is a position you are interested in accepting. Contacting them once per week is suggested. Our best post interview advice is to keep interviewing. Even if you feel that you were excellent in your interview and that this is the perfect job for you, you still need to keep interviewing. Sometimes things happen that are outside of anyone’s control and the position isn’t offered to you. Hiring freezes, mergers and acquisitions, in-company transfers can all make that ‘sure thing’ job offer disappear. Until you have a written job offer you should continue to apply for positions and interview. If you are uncomfortable going on new job interviews when a written job offer is imminent, you can adjust the timing of your interviews by scheduling them a few days after you anticipate receiving the pending job offer so that you do not waste anyone’s time. Ask These Questions to Make Sure You Accept the Right Job! Information to help you compare and evaluate job offers. Sometimes choosing what job offer to accept is super easy and other times it’s difficult to remember who is offering what or having to choose between several good options. Here is some information to help you make the choice when there is not a clear ‘winner’ among your job offers. One of the best pieces of advice we can give you is to ask the tough questions in the interview. The interview is your opportunity to hear the problems you might encounter in each position and is essential information to have when evaluating competing offers. Here are some questions you may want to ask if the answer hasn’t already been given. If you encounter difficulty getting information or answers in these areas it might be a red flag warning you that the job will not provide everything that you need in your first position. Is there a written job description? What would a regular workday be like? This information should help you gain a sense of the management, organization and work environment in general. A lack of basic employment infrastructure and clear expectations can lead to miscommunication and unmet expectations. What will I need to accomplish in the first 30, 60, 90 days on the job? How is success measured in this position? How is formal and informal feedback given? What will I like most about this position? What assessment tools, therapy resources and technology will I have? The answers to these questions are more subjective and speak to the style of supervision and the performance values. Only you know what you find most comfortable and supportive. You want to avoid unrealistic expectations and make sure you are able to meet performance expectations. Your CF will require you to transition from student to professional with all the stress and work that entails. We encourage you to seek an employer whose available positions align with your own natural style and values in order to lessen your stress. What new employee training will be provided? How are new questions and ongoing on the job training issues addressed? What was the biggest issue for the department last year? What are the biggest challenges I will encounter as a new graduate on staff here? After each interview, based on the information you have and how the interviewers made you feel, decide if this is an acceptable position or if it is THE position. Sometimes you just know when the job is right for you. But if you don’t receive the preferred job offer and need to choose a backup option or if all of the jobs are acceptable but none of them are perfect, here are some important comparisons to make between the job offers you are evaluating. Offer in Writing Information given to you in writing is legally binding. Verbal promises are not. All employment offers should be in writing. You are not committed until you accept a written job offer, nor is the company. Annual Compensation Hourly rates are not the best comparison for annual earnings. To get the most accurate financial information calculate your hourly rate multiplied by your guaranteed work hours. If you are not guaranteed work hours you may not earn the wages you expect, may not meet your minimum income needs and may not progress through your CF work hour requirements. Sign On Bonus You can anticipate a lot of unexpected expenses as you transition to the new job and your first paycheck may not be issued for up to a month after you begin work. An employer who addresses these needs shows a commitment to making your transition to their staff easier. Benefits Coverage Make a list of benefits to be provided to you: Health Insurance, Prescription Coverage, Dental, Vision, Sick Pay, Vacation Pay, 401K/Retirement, Continuing Education, Professional Dues (ASHA), Mileage Reimbursement, Student Loan Repayment, etc. Also, note what is not provided that you may have to provide on your own. Benefits Costs and Limitations Calculate what your out of pocket costs will be: Payroll Premium Contributions, Co-Pay Amounts, Deductible, Annual Maximum Out of Pocket, Maximum Annual Coverage, and the cost of any items not provided, such as the cost of uniforms, summer insurance coverage if you are in a school contract, pay back/claw-back terms if you leave the job, or your state license, ASHA dues or CEUs if these are not reimbursed by your employer. Relocation Costs The costs for relocations are probably tax deductible (for now) but these costs are part of what you will need to cover before you can receive your first paycheck so know how much help you will be receiving from your new employer. Housing and Cost of Living Calculate the cost of your deposits, housing costs (rent), utilities, but also calculate the cost of toll roads, gasoline, trips home, and amenities you need to be comfortable such as a gym membership, or entertainment available in the area. Intangibles Evaluate the intangibles such as license assistance, relocation assistance, the Mentorship you will receive, the new skills or certifications you might obtain, your job stability and advancement opportunities you will receive in each position. Travel Status If you are eligible for Travel Status under the IRS Tax Code will your employer offer you a compliant Travel status compensation package? Verify taxable wages, reimbursement amounts, value of company provided travel status items, and Per Diem amounts. Next week we’ll share the before and after interview protocols that will help you establish a positive image with your future employer. Takeaway Tip: Little differences have a big impact on both your job satisfaction and financial stability. Take the time to look at the details of each job to make sure you are accepting the best option available to establish the foundation for your career! Prepare for Your Interview -Strategies for Being Your Best! Strategies for computer, phone, Skype and in-person assessments and interviews. Prepare for Your Interview - Strategies for Being Your Best! It’s time to pull everything you have done so far together and go interview! Whether you find it exciting or scary, this is your time to make sure that you are offered the position you’ve worked so hard to achieve. We want you to be successful, and so does your future employer!. Both you and the company conducting the interview will be assessing how well you fit into a position compared to the other applicants. Your clinical skills, your interpersonal skills, your judgement, work ethic, and probable job satisfaction are all on review in an interview. So come prepared to tell your story in ways that show your best qualities and suitability for the position and to ask diplomatic questions to find out what you need to know before you accept an offer. Interviews occur in a variety of ways and stages. The interview priorities change depending on the type of interview, format of the interview, stage of the interview, and even person conducting the interview. The best ways to ace each interview changes as well. Interviews go through several stages and are often with multiple people within the company. In each of these stages, people will be scrutinizing a different aspect of who you are as a person and as a clinician. Pay attention to what interview stage you are in and who you are speaking with so that you can create a strong positive impression across the board. An initial or screening interview is generally looking for a neat and professional appearance, confidence and friendliness. A formal or clinical is usually examining your experience, skill set, critical thinking and judgement. A peer or informal interview might weigh your team spirit, flexibility and personality. A Human Resource interview tends to be more focused on making sure you are able to complete training and comply with regulatory requirements. By assessing yourself in these areas in advance of the interview you will be able to remain relaxed and focused on the important aspects in each interview stage and with each member of the interview team you encounter. There are many types of interview and you are likely to encounter all of them over the course of an interview cycle. Here are some of the types of interview questions you are likely to experience separated into categories so that you can prepare appropriate answers in each category and ensure a smooth and confident flow in your answers. General questions are usually part of the initial interview and are more open ended so that you can give a broader, more general picture of yourself. These types of questions might be as odd as ‘What type of vegetable are you and why?’ to the well-worn ‘Where do you see yourself in five years?’ or ‘What are your strengths and weaknesses?’ As cliché as these questions are they do serve a purpose. They may be designed to see how you respond to something when you are caught off guard or to make sure that your long term goals match with what they can offer you in your career over the next five years. Sometimes you can gain important insight into how best to answer these types of questions by considering who is asking them. So be prepared to stay professional, keep smiling, and roll with these types of questions by thinking about the context in which they are being asked. Although we all know that your skills have to be good enough to graduate and pass the Praxis, specific employers will be looking for specific skills and experience relevant to the position for which you will be employed. Expect questions that address what ages and diagnosis you have worked with, specific equipment or software programs you have used, and your familiarity with terms and processes within the work setting. Read the job ad, position description and company website carefully to make sure that your answers align as much as possible with what you know the hiring manager will be looking for in selecting someone for the position. As a new graduate, you may not have all of the experience that the hiring is the manager would like you to have. Be sure that you can show the transferability of your existing skills and experience to the position you are interviewing for. Go to Sarah’s Clinical Tips regarding Transferable Skills and what terms a Special Education Director might expect you to be familiar with when applying for a position in the schools: School Talking Points 1 and School Talking Points 2. You can expect some questions that seek information regarding your character and how well your personality will mesh with others you will be working with. Although cultural fit is the primary focus of these types of questions, according to a recent LinkedIn article your prospective employer is also looking for traits that will allow you to contribute now as well as grow in the position. Attributes most employers find desirable include adaptability, collaboration, ability to prioritize responsibilities, and leadership potential. Situational interview questions have become the norm and it is an area where you should invest more time in preparing how to address these types of questions well. Usually, a situational interview question will ask you about a specific event or situation and how you conducted yourself in order to meet a challenge or overcome a problem. Your future employer is assessing your critical thinking, problem-solving abilities, and judgement with these types of questions. The question may be posed relating to a situation you have or are likely to encounter on the job or it might be a more open question allowing you to select any relevant situation from your experience. One of the best techniques for answering these types of questions is the STAR technique. ‘STAR’ stands for situation, task (overcome the challenge or problem), action, and result. By giving yourself four steps to use to answer, you can showcase your strengths in each step. Using the STAR outline allows you to tell your story concisely and effectively. First use the S step, Situation, to restate the situation and the context in which it occurred. This is an opportunity to show active listening and good communication skills. Then use the T step, Task, to identify the challenge or problem, demonstrating your critical thinking skills. The A step, Action, shows your judgment and problem-solving skills. Finally, the R step, Result, allows you to share what you achieved, what you learned and what you value from having the experience. There are many excellent resources available to help you use this technique to effectively answer the more complex aspects of your interview. An internet search will yield many examples for you to use when preparing your STAR stories. Your actual interviews might include an on-line test, a phone interview, some type of Skype or virtual interview and one or more on-site interviews with individuals or teams. It’s hard to be ready for everything but it’s helpful to take a few minutes and learn the advantages and disadvantages to each. Learn to use each to your advantage and showcase your strengths. Online interviews are standard and statistical so in some ways they are the most impartial candidate evaluation. In some cases your resume submission to an ATS system (Applicant Tracking System) is your online resume evaluation so it’s critical to not fail this first essential step! Sometimes, you will be asked to sign in to a specific website and complete an online assessment. Just clear your head, get in a quiet work environment and do them! Interviews conducted by phone are usually initial interviews and are more general and informative. You might want to have notes (or a spreadsheet) at hand to make sure you cover everything you want to know. Since you will not have visual cues in a phone interview you will want to be more aware of voice tone and listening skills. Allow pauses and pause yourself during your answers as it is easy to interrupt a speaker or to run on too long when someone wants to interject a question or clarification when speaking on the phone. Sometimes energy levels don’t come through well on the phone so keep a smile on your face, it can be heard in your voice, and stand up, it allows you to breathe better and improves voice tone. Specific salary information is generally not available at this stage of the interview, but almost any other question is fair game. When you are trying to compare multiple job options it’s useful to keep organized notes and it’s a huge advantage to be able to do so! FaceTime, Google Hangouts, Skype or other types of internet based face to face interviews are becoming more prevalent so in addition to making sure you are familiar with the technology and that it’s functioning well here are some other tips for excelling in this interview format. Have a practice interview with friend and check out your technical setup etc, especially if you are unfamiliar with any service or software being used. Check the speed, visual and sound quality of connection from the location you will be using to avoid awkward problems when the interview time arrives. Although this type of interview is almost like being there in person there are still a few advantages you can prepare for and exploit. You will want to sit at a table or desk so you feel more professional. Make sure there is nothing visually distracting behind you, and take steps to minimize any background noise. The same voice tone tips as stated in the phone interview section apply for these interviews. Since you will still have some degree of visual privacy, you can prepare note cards to help cue your answers and remind you of questions you want to ask. Remember to make eye contact with the camera, not the monitor. On site interviews can be with either an individual or with a group of individuals. You will want to arrive a few minutes early for your interview and bring a copy of your resume and references with you. Your dress should be professional but comfortable. When meeting with an individual you want to establish some type of professional rapport as soon as possible. Prepare some simple complimentary comments such as appreciation for the clarity of directions, attractiveness of building or part of town, etc. Show your social manners until the interview begins. Once the interview begins, allow them to lead the conversation but remember the tips given above regarding facial expression, voice tone, energy levels and context of the questions being asked. It is okay to bring a notebook to the interview but ask for permission to take it out and take notes before doing so. If offered the opportunity to ask questions be prepared to do so. Failure to ask questions is often interpreted as a lack of interest or focus. If you are interested in the position, ask what the next step is in the interview process and what the timeline for a decision will be in addition to any other questions you might have. When speaking to a group, remember you are both interacting with someone and being observed by others simultaneously. To prepare for this complex type of interactions, practice active listening vs passive or assumptive listening and respond in ways that allows each member of the group to know where your focus is even when they are not the person with whom you are directly interacting. Make sure to shift your focus and make eye contact with everyone in the group as the interview progresses. Takeaway Tip: Every interview is different but if you prepare for all types of interview stages, formats and questions you will be calm, confident and focused throughout the most demanding interviews! Research companies' opportunities before investing your time in an unacceptable job option. We’ve given you a lot of information so far about preparing for your job search and hope that you feel confident and have a good understanding of some of the terms you will run across in the job postings and descriptions you’re finding. Now it’s time to spend a few minutes considering the final step before you start sending your resume out! How do you make sure that you are spending your precious job search time on opportunities you would actually want to accept if the position is offered? Research! Before you send your resume anywhere, you will want to research the company and their available opportunities so you are not investing your time in an unacceptable job option. But how do you decide if you want to interview before you send your resume? Unless you have personal knowledge of a company and their work environment, word of mouth from your friends and professional acquaintances is probably your best source of information about good companies to work for during your CF and beyond. Ask your classmates about their experiences at extern sites you did not get to work in, ask professors if they know of places that other new graduates have found ongoing job satisfaction, and ask coworkers at each of your clinical externships where they would suggest applying if the location you are at with them might not have a spot for you or isn’t the clinical setting you want to work in. Very few people will offer comments regarding other employers but they are generally happy to answer questions you have regarding the good, the fair, and the problematic employers in the area if asked. So ask when the opportunity comes up! If you are not in touch with or don’t currently know other SLPs you can ask about specific employers, use social media sites to find friends, colleagues, program alum, etc. who have worked for the company. LinkedIn and Facebook are the most likely options since so many people list their current and former employers along with their university so it is easy to search out people you know or who attended the same university that you did. People you have met and people who have a connection to you and an understanding of your training and circumstances are most likely to provide you with the information you need. But sometimes, because of circumstances outside of your control, such as location you will be job hunting, time constraints, etc., you can’t find someone you know who can share inside information about a company you are considering. Then what? Research about companies is pretty easy to do these days. A minute spent checking things out before hitting that apply button will pay dividends by sparing you the frustration of a bad experience and the knowledge that you wasted time and resources on an opportunity that wasn’t acceptable. Research the company first by Googling their name. See if they are involved in litigation that might affect your career or are making headlines in the local press for other reasons that would negatively affect your employment. Hang on to their website for more in-depth research. Sometimes, companies going through these types of problems are making changes and being extra careful with their new employees so you want to dig deep enough to be confident an opportunity should be eliminated or if this is an opportunity to get in on the ground floor of a rebuilding effort. Another great site to use to find out how other employees rate an employer is GlassDoor. Current and former employees rate their interview, onboarding, offer and work experience on a scale of one to five. Plus they can give an explanation of why they gave that rating! You can also check out medical professional rating sites, local BBB, and local professional sites, especially if you will be moving to a new area. Sometimes it’s the not the company that you want to check out more, it’s the location. Evaluating the location can be harder but here is a site that might help: city-data.com. City-data.com compiles information from every government statistical collection entity and multiple private statistical collection entities to provide you with detailed information regarding every city/town in the country including schools, weather, crime, employment, demographics, average wages, housing, commute ranges, cost of living, proximity to desired amenities, and more. Having used this site for many years, let me mention that the amount of data can be overwhelming and can lose meaning when viewed without a point of reference. You can help overcome this by comparing a comparably sized city you are familiar with to the new location you are researching. It helps to be able to understand that 28 inches of snow in new location A is less than the amount of annual snow in known location B.
We’ve given you a lot of information to understand the terms employers use and the information they include in their want ads but sometimes you are looking for that little bit more. Another location to look is the company’s own website where company history and philosophy might be posted and you might find information specific to the department that has the vacancy, such as size, structure and specialties. Reading the job description, terms and conditions carefully will help you understand what exactly is being advertised and the company website might help you assess how well the advertised position suits you. And it has the added bonus of helping you be more knowledgeable and confident when you interview with them! Researching compensation and benefits before the interview can be harder but it isn’t impossible. Many times you can locate prior or similar ad posts on Indeed.com where salary ranges and benefits are given. In medical settings, such as hospitals and nursing homes, this information is only available with a job post and often can’t be found on the company website. Some salaries, including public schools and government positions, are public record and can be found on the company website or in Board minutes. When these options don’t work, you may be able to get an idea of the salaries in the area through wage compilation sites including ASHA, CareerBuilder, etc. Be aware of how the data was collected (regional differences in wages and between different clinical settings are significant) and sometimes only average or median wages are given. New graduates will not make wages comparable to the ‘average’ SLP in any given work setting or geographic location because the ‘average’ SLP has 12-15 years of experience. Assume you will be offered the low end of the range for your targeted geographic area. Before you decide that a particular wage is unworkable, work an annual budget. The best jobs are often some of the lower paying ones, because there is competition for great positions and companies don’t have to pay more than what is being offered to hire qualified staff just as there is generally a reason why an employer has to pay a significantly higher wage in order to get someone. Take job satisfaction and clinical support and learning/training investment in you into account as part of the benefits an employer provides. Deciding what employment terms or work environment you need, will let you eliminate many job posts without wasting a minute on them, freeing up time for you to spend a few minutes researching the job options that do attract you interest. Doing your research can save you significantly in future time, energy and money if one or more site trips are involved. But even your best research efforts may not turn up all of the answers you are looking for. When this happens, make a list of questions yet to be answered, missing information, issues of concern, both clinical and non-clinical and make sure that you receive this information some time during the interview process. 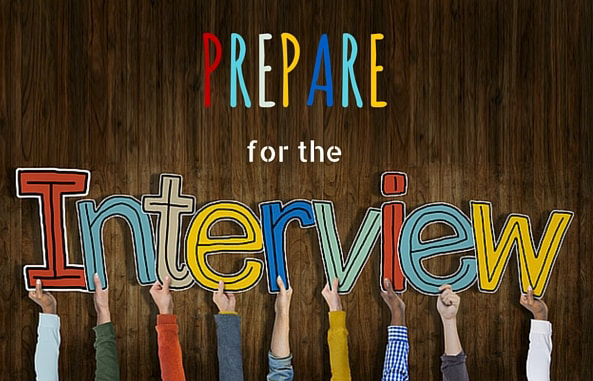 Next week we’ll cover how to prepare for the interview! Employers want you to want to do the job they have available. Asking about salary as your first question may offend them and it creates an impression that you are not interested in what you will be doing clinically as a CF-SLP. All Those Jobs! Information helps you understand who you are talking with to ensure a positive interview experience and ultimately a great job! Everyone searches for available jobs using the Internet, but how can you be sure that sending your resume off to an unknown company or email address will yield a positive interview experience and potentially a great job? You're right to be cautious. We've all heard the horror stories. Here is some essential information to ensure that you safely navigate all those job posting sites and end up with that perfect CF job. 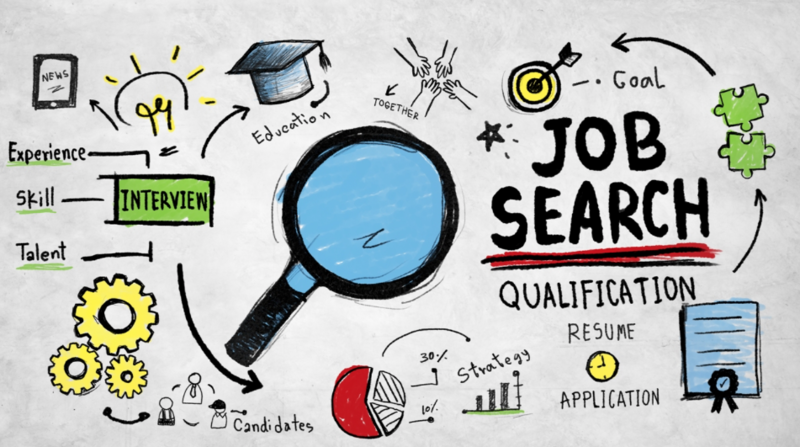 It may seem obvious once you hear it but there are many different kinds of job boards out there and depending on what you're looking for you may have much better results with some than with others. Sometimes it can feel like you are sending your information into a black hole in space, so if you do not receive an acknowledgement of your resume within a week, you may not receive one. It’s not you! It’s them! The first is an SLP profession specific job site such as ASHA, your state Speech Association, or SpeechPathology.com. These organizations vet the companies that are allowed to post vacancies on the site so you are likely to find more suitable positions and fewer non-relevant opportunities. However, smaller companies are under represented on these sites as they can be expensive for an employer to post jobs when they only have one or two vacancies a year. Also companies that hire across a wide variety of job classifications may post first on the more general job sites to save money since the more jobs a company posts on the same site the lower the cost per job post. Another good source for your job search is the larger general job boards such as Indeed, Monster, CareerBuilder, ZipRecruiter etc. Larger companies, and non-profits such as hospitals are more likely to post their jobs on these sites. By purchasing an annual subscription these larger entities can post jobs for every job classification and receive all applicants through a consistent process. These job sites are much less likely to monitor job postings unless they receive multiple complaints so be careful when considering applying for jobs with companies you aren't familiar with or can't easily check out. When making yourself available on these sites, we recommend that you do not post your resume on these open sites, instead just provide a profile with an email address to contact you. You can upload this brief summary profile in lieu of a resume for general view. You can still apply for positions that interest you and submit your full resume only to the companies that you know that you want to work with but it prevents your resume from being submitted to a third party without your consent or having your information be sold or used for a purpose other than you intended. Newer to the job posting scene, but still important to consider, are LinkedIn, Glass Door and Facebook. The nice think about these sites is that it is much easier to evaluate the company as well as the job post, and see if you know others in your profession who have worked for them before you apply. It’s nice to have someone in your profession who has information about a company prior to interviewing. If you are interested in a position with the Government or Military you will need to go to their official jobs sites. These jobs are almost never posted in any other location. Competition can be fierce for these jobs and expect that the application process will be longer. ASHA has assembled a list of Government and Military jobs sites you can view here. Private companies, Schools and Agencies/Staffing Companies almost all have dedicated job sites on their web sites. If there are specific employers that interest you, check out their web sites directly. You can generally apply with Agencies/Staffing Companies and School Districts at any time, but many companies no longer allow you to submit a resume unless there is a position available. Decide what types of companies you will consider before posting or sending your resume. There are advantages and disadvantages for each. Being employed by the government, public schools, military and non-profits currently qualify you for some loan forgiveness programs that you cannot participate in if you are employed by a for-profit company. Private and public for-profit companies tend to offer higher salary and stronger mentorship for new graduates, but the pay gap closes over time. Private and smaller companies and organizations tend to have more accessible leadership. You should know if the company you will be working for is US based or has a strong US presence. Decide what employment structures and employment terms you will consider before applying for a position. There is a huge difference between being an employee or being an Independent Contractor. Independent Contractor means that you are self-employed and will receive no benefits and will be responsible for both the employer and employee payroll taxes due. Read more about Independent Contractor requirements on the IRS website here. Find out about what IRS Travel Status means before considering this option. If you qualify, it can be financially advantageous to have a portion of your income given or reimbursed on a tax free basis. The companies that use this type of employment structure have different policies for how they provide for their staff who meet the IRS qualifications for Traveler. 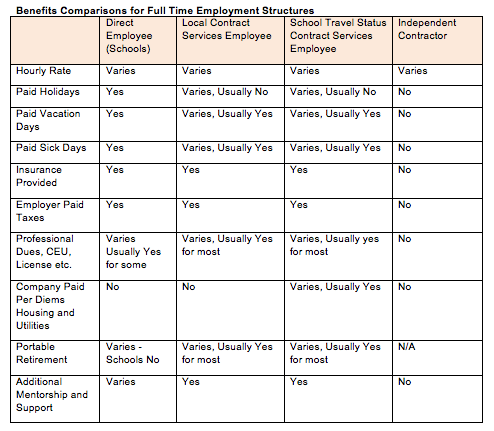 Make sure you have a good understanding of this compensation structure before accepting a position on Travel Status. You should talk with a CPA Tax Accountant prior to signing a contract for this type of employment. You can read more about the benefits and requirements of Travel Status on the IRS website here and here. Make sure that you have all the terms defined before accepting a position. AND YOU ARE NOT COMMITTED TO ANY POSITION UNTIL YOU SIGN THE EMPLOYMENT AGREEMENT/CONTRACT. Don’t be rushed to accept a job before you understand all of the terms being offered and don’t feel compelled to accept a position if the written terms offered are not what was discussed with you verbally. Below are some of the terms that you will want to make sure are defined by the employer you select as definitions can vary from company to company. Full time can be any number of hours per week from 30-40 or more. Full Time can mean anything from 9-10 months in a school setting to 12 months in most medical settings. Find out about mandatory overtime or required holiday work hours. Find out how holidays will be handled by your future employer. Make sure you understand your benefits, including your payroll deduction contributions, co-pays, deductions, maximum out of pocket and scope of coverage. Benefits vary widely and can add up to 40% additional value to your compensation package. Full and part time employees generally have guaranteed minimum work hours, while PRN and/or Per Diem employees usually do not have guaranteed work hours. Usually PRN and Per Diem employees receive a higher hourly rate of pay since there is no minimum number of guaranteed work hours. A Per Diem employee is not the same as an employee who receives a Per Diem payment as part of their compensation. Companies may describe a position as Float, Itinerant, or Travel but how each company defines and supports these types position is different. Make sure that you know what the company you are considering means by these terms and how that definition affects your interest in the job and ability to be successful in the position. Travel Status almost always refers to your employment status as a Traveler under the IRS tax code. Make sure that you will have both an Employment Supervisor and a CF Mentor. Since not all states require you to complete a CF, not all companies provide CF Mentorship. You do not want to discover this type of miscommunication after you start the job. Take away Tip - Referrals are the easiest way to avoid the downside of a start from scratch job search to find out about good jobs and get all of your questions answered before sharing information about yourself and investing time and energy into a job that isn't right for you! It’s great when you can get clear expectations of the company culture and expectations from someone you know and trust. Take stress out of your job search. Tackle tasks in order, one at a time. Many new graduates stress about finding a position that will let them begin work as soon as possible after graduation. We understand that the logistical issues associated with a new job and a possible move paired with those looming student loan payments can induce anxiety but there are some fixed dates that will determine your start date in a new job. You can't begin work until you meet certain requirements and you will need documents from your university in order to meet these requirements, namely your transcripts (or a letter of completion in some states), and your Praxis scores in some states. Planning your job search with these requirements in mind will help you know when to begin preparing for your job search and when to actually start applying for available positions. Complete a basic resume by March if you are graduating in May, sooner if you will be applying with one of your early clinical training sites. Expect to need a few variations of your resume so completing a new version after each new clinical externship will allow you to layer the new skills into a document for that clinical setting. You will want to request references as you complete each externship and compile a reference sheet document separate from your resume. Keep it current and stay in touch with your references as you complete your final year and begin your job search. Your reference might be changing jobs, getting a promotion or adding a credential and you will want to be up to date with the changes in their professional life as well as keeping them informed regarding your career plans. If you graduate in May, you will want to get a working draft cover letter completed by March also. You are likely to need several versions of your cover letter and too many job seekers fail to give this document the time and attention it requires. A strong cover letter, in some settings, is as important as a strong resume for a new graduate. You can begin looking for positions at any time, but be aware that you may not be considered for a position simply because you are applying too early for them to consider you based on when they need to fill the position and when you will be available. The general rule for beginning your job search is to begin applying for positions within 8 weeks of when you hope to begin work. This is true in medical settings, but not always true in school settings. Schools generally begin interviewing around Spring Break through July. They stop interviewing when their positions are filled. 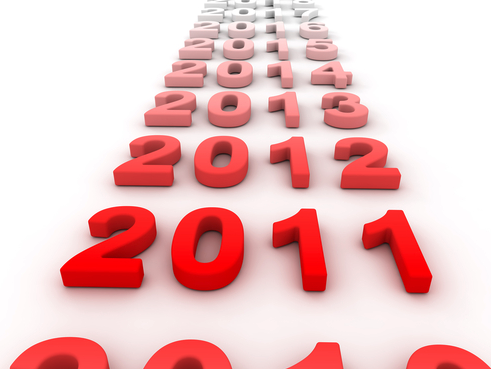 Contract staffing companies interview year round. Here is specific information new graduates need to keep in mind based on the clinical setting and type of employer you will be applying with. Companies generally expect you to be able to begin work within 30 days of when you accept a position. Schools expect you to be present for training and fully certified by the first day that student return to school. If you plan to apply for a position at one of the locations at which you completed an externship, let them know about your interest if they bring it up or towards the end of your time there. You will usually need to have a resume that is complete through the current externship and lists the remaining clinical sites to give to HR even when the Department has requested that you apply with them. Some CFs who find a job prior to graduation accept a position at one of their clinical training sites. If this is not the case for you, you can begin applying for positions as soon as you have completed your clinical training(s) in the clinical setting in which you hope to become employed and no later than when you enter the eight week job search window if you are applying for positions in medical settings. If you are primarily interested in a school position and have completed your clinical training for that setting, you can begin applying for positions any time after March 1st for most schools. Between 10% and 15% of all SLPs work for a staffing company. They will generally begin CF interviews in February for the following school year or when your resume is complete for the clinical settings you will consider if they staff for both schools and medical settings. Customize your job search plan based on any individual commitments such as vacations, weddings, and other events that might interfere with your job search or make you unavailable for interviews. Use a calendar to plan for these personal commitments along with when you will be completing externships in the clinical settings you prefer, when you will have your Praxis scores if they are required in the state in which you plan to work, and when you will have transcripts available or be eligible to get a letter of completion if you will be working in a state that accepts them. Allow for the time it will take for license or certification to be issued after these documents are submitted and begin applying for positions about four to six weeks prior to when you will have these documents and be able to apply for license/certification. Many employers offer pre-employment training or mandatory new employee training only one to four times per year and your start date may be based on the next available training dates. Some employers time interviews to correspond to these on-boarding dates and have hiring cycles at specific times throughout the year. If you know someone who already works at a company you want to apply with you can find out this information and also take their timing into account in your job search timeline. Licensure or certification can take from 2 weeks to 3 months from when everything is received complete and correct in the credentialing authority's office. Be aware of the amount of time this might take and how it affects your availability to begin a new position, as your employer will probably know this information as well. If you give incorrect information regarding your probable license/certification start date it may make them wonder what else you haven't checked out. We will giving you more information about licensure and certification in a later article. 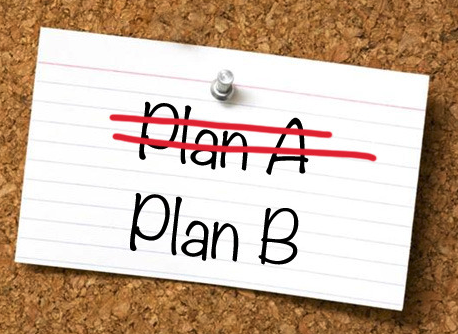 Every job search plan needs to include a date when you will consider implementing your back up plan. This might include considering a larger or different geographic area, a different clinical setting or a temporary or travel job option. By making this part of your plan, you will not be rushed into making a decision and can be confident that the choices you make are the best ones for you based on the opportunities available. Takeaway Tip: Developing a job search plan timeline will take stress out of your job search by allowing you to tackle your job search tasks in order, one at a time. Tips to get through screening processes with a readable and effective resume. Your resume is the distillation of the last six or more years of your education and graduate school experience into an effective document that presents a compelling reason why the employer you want will also want you. As you prepare your resume, don't let a technical or minor misstep prevent your resume from making through the screening process. Here is some systemic information to strengthen your resume as well as tips to ensure your resume makes it through the screening process so that your resume content gets seen by the hiring manager. The first step in making sure your resume gets seen is to understand how your resume will be received by the company or school to which you are applying. Each has a process for considering applicants for employment and understanding that process allows you to use the right approach in each situation. 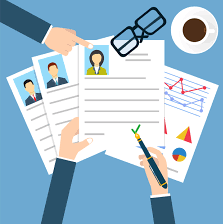 You will find that you need to use different resumes and resume formats depending on the process your potential employer will be using to screen your resume. This article will explain some of the various technical and human processes and how to best navigate them. Knowing how your resume will be screened will allow you to get past the initial process barriers being used and get to the interview phase. Sometimes it is better to use a PDF format for your resume and sometimes it is better to use a document format. Larger institutions generally use an Applicant Tracking System (ATS) while smaller entities are less likely to use an Applicant Tracking System (ATS). These computer programs review and score resumes received against the job criteria for the position. In many ATS systems, no one sees the whole resume, just the ATS compilation version of how you match their requirements. Only those applicants who clear this barrier are considered and it may be that only the ones scoring above a certain score or in the top percentage of these are presented to the Hiring Manager for consideration. Some ATS systems cannot accurately read PDF formats. Resumes should be submitted in a .doc format not a PDF or .docx format if you believe that an ATS program will be used. While ATS systems are getting better all the time, it is better to use a document format when you know an ATS system is being used. PDF formats are more secure if you are sending your resume to a company with whom you are not familiar. Your resume structure should be very simple. Keep your resume clean and light on the page. Avoid using templates, including headers and footers, creative fonts, complicated layouts or having tight margins. You may find that they are altered by the receiving software and become difficult or impossible to read. Be aware of where lines and pages break, and how tabs and bullets appear in different browsers and types of computing devices. One of the most important things you can do to successfully navigate the screening process is identify and tailor your resume (and cover letter) to the priorities of the system and person who will be screening and scoring all of the resumes received. Knowing if your resume will be screened by a software program, a Human Resource professional, a Department Manager not of your therapy discipline or a Hiring Manager who shares your clinical degree is critical. ATS systems use algorithms that score and compile your resume content against a set criteria. Cover letters may not be accepted. Human Resource professionals score and compare your resume against the job description criteria they have been given. They may not fully understand comparable terms or abbreviations so matching the exact words that are in the job posting is essential. They will be assessing how long you might remain in the position, how well your availability matched with their preferred start date and mandatory training schedule in addition to your clinical skills and experience. A cover letter that addresses these concerns may be helpful. A Department Manager who is not a therapist will be assessing how well you might fit into the department overall culture and values as well as how your clinical skills and experience meet the position requirements and complement the skills of the other department staff. Are you flexible and adaptable? Will there be an appropriate mentor for you? Do you bring something unique to the team? Do you have an area of interest that they will encourage you to grow into? A Clinician Hiring Manager is rarely your initial contact person except in a private practice position. So even though they may not be part of the initial screening process, they are almost always included as part of a clinical or peer review interview process. They are likely to be the person who most closely analyzes your training and experience thus far. Make sure that you include complete and accurate clinical information and address clinical experience deficiencies through transferable skills. 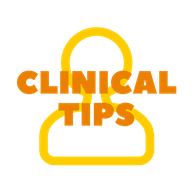 Use Week Five’s Clinical Tip regarding Transferable Skills from Sarah, click here for link to Clinical Tips Week 5, for information about how best to do this. This person is also most likely to be asking subjective questions to determine how you make clinical judgements and if you are someone they would enjoy working with. Staffing companies look at every resume and talk with you about the best match options available. Since they are working with multiple employers, locations and clinical settings they usually have at least one option for which they will consider you. They are a great way to get resume and interview feedback. While a great resource, many Staffing Company Recruiters are commission based so some may push you to accept a position with them before you are ready to commit or try to control your job search. You do not have to accept any position until you have reviewed an employment agreement and signed a contract The timeline for contract positions is usually more flexible as there are often multiple positions available. Resume titles can vary but only Education and Experience are necessary. Any other titles can be added to improve readability, but we recommend only including sections for contact info, experience, education, and skills/qualifications. The more categories you have the more likely it is that an ATS program will have difficulty slotting your information into the ATS data fields. A resume should not exceed two pages. Do not submit a vita for a clinical position. Adapt your standard resume to include the exact words from the job posting or job description for which you are applying. Each resume and cover letter should be modified to best fit your skills and experience to the position available. 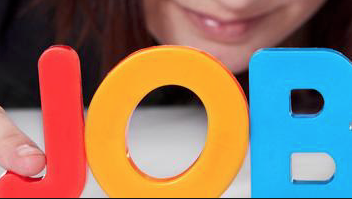 For example, don't use abbreviations on your resume if the ad spells out the skills needed and vice versa. Expand areas that match the job for which you are applying and edit areas that do not illustrate a transferable skill or have a direct application to the position for which you are applying. When only general information about a position is available, research the setting and address the standard skills required in that clinical setting. Examples of essential clinical information to include in an educational resume in Sarah’s Clinical Tips Weeks 3 and Week 4. Use strong active words to describe your experience and accomplishments: Treat, Manage, Teach, Plan, Write, Lead. Avoid using past tense or passive tense. Takeaway Tip: Omit street address, unnecessary titles and words, an objective unless relevant, “References available upon request”, information including work and volunteer experience that does not directly relate to your profession or illustrate a transferable skill. Tell your unique story to introduce yourself to your future employer. 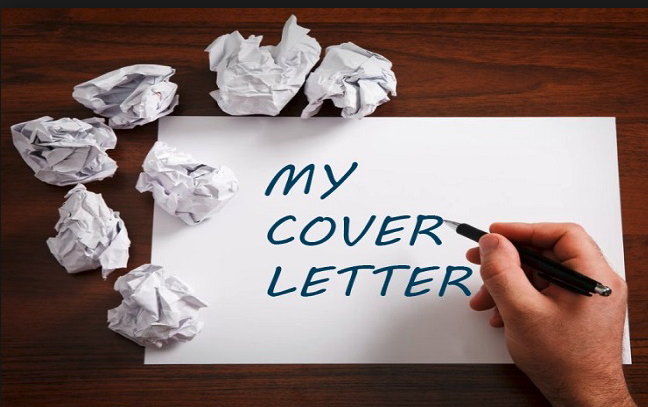 Your cover letter is your first impression introduction to the hiring manager for a position. Tone can be hard to convey in writing so take some time to practice before it's time to crunch deadlines. We suggest writing as though you are sending a formal letter to a friend. Follow all the grammar and business correspondence rules, but try to maintain a warm and friendly tone. This is another time when having someone else review your work is helpful, so exchange favors with a friend or colleague to get feedback until you are comfortable with maintaining a formal and warm writing style that matches your unique personality. Your cover letter can be a little more free form than a resume, and it is your opportunity to show your personality. Unlike your resume, a cover letter is your opportunity to share information regarding your character, motivation, work philosophy, interests and other information that might not fit into any of your resume areas. It should be both a likable and memorable presentation of who you are and a persuasive request for an interview. It is essential that this short two to three paragraph introduction is always specifically targeted to the job for which you are applying and the person who will be reviewing your resume. Many companies no longer accept applications unless a specific vacancy is referenced and this can account for a percentage of the no reply experiences you encounter in your job search. You want to apply for a specific position and submit your information to a specific individual. Your response rate for doing this research and personalization will be significantly improved. 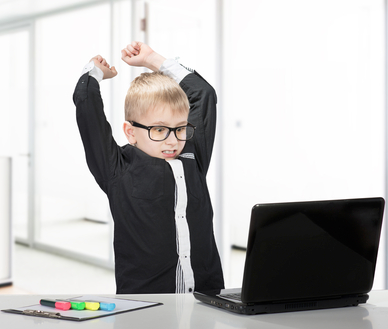 If a Human Resource Manager, Company Owner, Special Education Director and Supervisory SLP all read the same cover letter it is unlikely that they would evaluate it the same way. Each of these functions within a company will have a different perspective of what is most important when selecting a new employee. 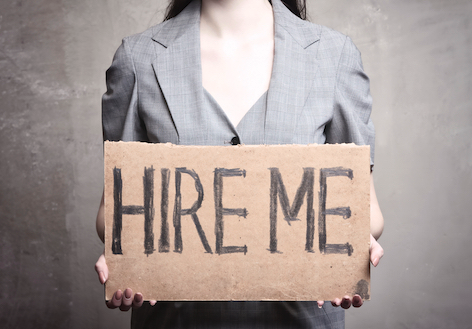 Be aware of who will be reading your cover letter and what their priorities are likely to be. Some of their priorities in addition to your clinical training and experience will overlap and some won't. Some of their concerns are addressed in the resume itself and some are not. Here are some things to keep in mind when crafting your cover letter. Your cover letter will allow you to address issues beyond what is included in your resume. Employers want to know that you want the position that they have available! A generic cover letter will actually weaken a good resume in any competitive job market. Review the advertised requirements and position job description and make sure that you address any areas not fully covered in your resume. Don’t be afraid to apply for positions for which you do not meet all of the listed requirements. It never hurts to apply and it can be good practice to strengthen your cover letter writing skills. When you do apply for jobs for which you do not fully meet all listed requirements you need to address why you are an excellent candidate for the position. Your specialty skills are important here! Are you experienced with different cultures, have a specialty skill or certification? Mention the value added attributes that you can bring to the position in addition to what has been listed in the advertised job requirements. I often see CF candidates selected over more experienced clinicians when they can articulate the ways in which they will excel if given the opportunity. Character, enthusiasm, flexibility, adaptability, communication skills, etc. are all attributes that employers value but are hard to demonstrate within the resume format. Use the cover letter to highlight the reasons for your personal passion for your profession or a specific caseload, examples that shows you are motivated to independently acquire additional skills and most importantly the transferability of skills and experiences you already do have to this new position. If you do not yet have your license or certification or if this has not specifically been addressed in your resume you might want to address it in a general way in your cover letter. A sentence stating you are familiar with requirements and anticipate securing appropriate credentials as soon as possible is especially helpful if your university is not in the same state in which you are applying for positions. Sometimes you will encounter a surprise ineligibility in specific state license or certification that eliminates you from consideration in a state or a type of clinical setting within a state you are targeting. It is better to find out before you begin interviewing. Employers generally know when there can be problems obtaining the required credentials and may be looking for your confirmation that you will not encounter any credentialing obstacles or delays. Familiarity and confirmed eligibility for appropriate certification or license in the state in which you hope to work is necessary and shows that you're informed and are prepared to accept an offer if one is made. Your cover letter needs to a positive, action oriented, persuasive introduction. Make it clear that you want to interview and easy for them to include you in the interview process. Let your potential employer know how to best reach you and if you have specific availability, like a break between externships or a time you will be in the area with an open schedule. Always include that you will work to accommodate their interview schedule as you are particularly interested in this specific position. Take away tip - Make sure the person reading your cover letter can tell that you have researched the company, know exactly what the job entails, and expect to be successful in the position if hired. How to Make Sure Your References Help Secure Your Job Offer! What your references say to your future employer can have a lasting impact on your career. Build a professional network to actively conduct your job search. References are part of your follow up message to your potential new employer. The strength of your references can determine if you get the job offer or not. References are often one of the overlooked aspects of the job search with applicants calling to arrange them after they have completed an interview. But one of the ways to make your job search stress free is to make sure that your references are strong advocates of your ability to contribute and function well in your new job before the interview! Their support can boost your confidence and deliver the message of your capabilities and strength when you leave the interview. Take some time to get this piece of your job search solid before you start interviewing, so that you can project strong confidence knowing you already have respected professionals supporting you in your chosen profession. As you complete your coursework and clinical training you will be learning from and working with Clinical Instructors, Rehab Managers, and therapy professionals in the clinical setting in which you want to secure employment. These are your best references and it is worthwhile to develop a professional relationship with them now while you have regular direct access to them. Plan for who will be your references throughout your final year in grad school. While offering a prospective employer five references is ideal, make sure that you have a minimum of three references with at least two of them able to speak to your abilities in your preferred clinical setting. Personal and non-therapy based references are probably not appropriate at this stage of your career. As you work in your clinical externships consider if the person you are working with and for in each location is someone who knows your skill levels and would be a suitable reference for you. Towards the end of your time in each clinical location, assuming things are going well for you, approach the person you would like to be a reference for you one-on-one and at a quiet time of the work day. Make the request in person and respect any hesitancies on their part. It is better to select a different reference than to a have a respected person express doubt about your abilities. It's a hard decision on their part as well, and there are many reasons why someone is not able to provide a reference. Showing your professionalism even if you are disappointed, keeps the door open for the future. Make it a priority to ask those who directly taught or observed you in the clinical setting but when that is not feasible, you may also include someone who is familiar with your work but did not directly supervise you. Concentrate on building mentor relationships with these professionals who are already working in the clinical setting in which you want to work. An employer may accept letter of reference but more and more employers are using a specific reference form or on-line reference system. Ask if your reference is open to providing either option, if your potential employer only accepts one form of references. If they are writing you a letter of reference, let them know what you believe your strengths are in case they want to address them also (productivity, quality of services, scope of knowledge, time management, patient rapport, paperwork, etc.) and give them a current copy of your resume. It is okay if your resume is incomplete but make sure the section dealing with the clinical experiences with which they are familiar are in place. On an incomplete resume, also show the timeline dates and types of future clinical settings if they are known, so that they can see the progression of your skills prior to your job search. Ask if they would like to receive an updated resume when it is available or if the current incomplete information is sufficient. Serving as a reference is a personal endorsement from them that deserves appreciation. Express your professional respect for them and your understanding of their time commitment to support you. Share with them what their impact on your training has been and what it means to you to have them be a reference. Give them some words about what your career means to you. Their assessment of your skills as a therapist, expressed to your future employer can have a lasting impact on your career and determine if you receive the desired job offer or if another candidate with more enthusiastic references prevails. Throughout your training, in every clinical setting and among your instructors and supervisors, strive to be memorable in a good way. New graduates are not expected to know everything. They are expected to keep a good attitude, be flexible, learn as much as possible and find a balance between independence and asking for help when needed. Allowing your professional references to see your character as well as your clinical skills is an important aspect of their ability to endorse your suitability in a position. Follow up with a thank you to each person who has agreed to be a reference for you. As you complete each positive interview, drop them an email or phone call as a heads up notice regarding the potential job offer if you believe they will be contacted. Thank them for their support when you accept a position. People like to know that they helped and that you appreciated their contributions to your success. Next week – What SHOULD be in your cover letter? Build a professional network to actively conduct your job search! The world of social media is used for everything! Here are six ways you can actively use social media to advance your job search using the sites you already use. Last week we talked about the steps to take to make sure that potential employers who are checking you out receive a positive image of you. 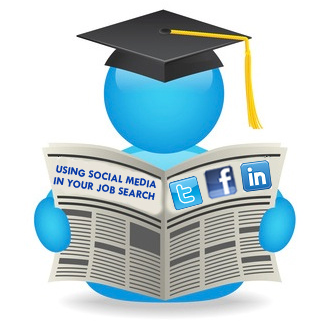 This week we want to go over some of the ways you can actively conduct a job search using social media. The five sites we suggest a CF-SLP should focus on are ASHA, State Associations, LinkedIn, Facebook and Glassdoor, but there are many more. All of the activities presented here are free and just take a few minutes a day once your profile is complete. Building a professional network is a habit you will want to develop to access professional information, build a resource bank, find out about and be introduced to companies with vacancies that interest you and to gain support and encouragement. Some activities can feel awkward at first so we’ve started you out with a simple example for each type of activity. There are many opportunities on social media sites where you can let people know you are in the job market. A simple announcement with either a sentence about your job search or a link to one of your appropriate profiles lets you state what you are looking for and where. I am graduating from (Name Your University) in May and am looking for a CF position in an elementary school commutable from Baltimore, MD. Here is a bit more about me (Link). Any suggestions, or feedback is appreciated! Sometimes connecting with others is as natural as your smile and sometimes it can feel uncomfortable or awkward. The importance of making professional connections at every stage of your career is so valuable. Some universities are now also actively encouraging students to build their professional network using LinkedIn, ASHA or their state associations. All are good options that will enhance your career. Start by connecting to your university professors and clinical instructors who are active on social media. I would like to add you to my professional network and hope that we can stay in touch after graduation. I learned so much at the clinic and know that I want to continue working with children. Thank you so much for being one of my references. I am looking forward to beginning my career using the training and experience you’ve given me and hope that you will help provide the foundation of my professional network as well. Before you make contact with a potential employer you may want to check them out! Most companies have a website, Facebook page, Glassdoor profile, company LinkedIn page, Pinterest, Twitter and more. This is all public information you can use to see how their jobs match with your wish list, which positions you want to apply for at this company and if there are any concerns you want to check out further. Connecting with or Following them is usually as easy as a click request but if you need to make contact don’t be afraid to do so! Most companies will respond to your inquiry or comment. Sadly, some companies do not respond but that, too, is useful information to know about a company you are considering. I saw your recap for the ASHA convention on your LinkedIn page and wish I could have been there this year to meet with you. I am graduating from (Name Your University) in May and am looking for a CF position in the Orlando, Florida area as I will be relocating there this summer. Here is a bit more about me (Link). Can you let me know to whom I should direct my resume in order to be considered for a CF position with you in that area? 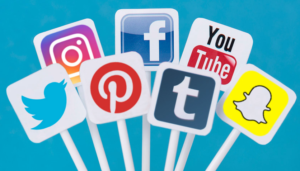 Most social media sites offer forums for specific clinical interests, and for those who are looking for a specialty area of practice these more focused entities are essential places to connect with those who may know about these types of position first! Thank you for including me in your group. I wanted to introduce myself and tell you a little about my AAC interest. I am graduating from (Name Your University) in May and had wonderful training and experiences with children K-6 using several different AAC Apps and devices. I am looking for a CF position in California working in a school position that includes children using AAC devices on the caseload. Any information or suggestions is appreciated! I know this is my skill set and can’t wait to find my California CF job. At the heart of social media is the desire to communicate and connect with others who share a common interest or profession. In general, people who participate in online communities like to help people when it’s within our ability to do so. Most savvy participants know that their contributions and assistance to the other members of the group will be repaid to them when they need help, too! Don’t be afraid to ask, but also don’t be offended if someone fails to connect or respond. Your network reflects you and just keep reaching out and building! Soon people will be asking YOU for help! I am contacting you because I saw that you also graduated from (Name Your University) and work at (Target Company). I am graduating from (Name Your University) in May and am looking for a CF position in an elementary school commutable from Philadelphia. I know this area can be a difficult area to find a full time job. Here is a bit more about me (Link). I am hoping you can give me some insight into the interview process there and make suggestions regarding how to increase my chances of obtaining an interview. I welcome the opportunity to add you to my professional network and if you think I would be a good fit with (Target Company), can you let me know if there is a specific person to whom I should direct my resume? Hot jobs are often promoted by companies through their many social media sites. Even if the job is not exactly what you are looking for, applying for one of the promoted jobs might get you to the top of the interview pile sooner. During the interview process you may decide to actively pursue the promoted job (often for a higher salary or special perk), find out about other positions in the company that are more suitable for you, and/or hone your interview skills so that when the perfect job comes along you are more prepared to impress! I am interested in hearing more about the position posted on your company website. I am graduating from (Name Your University) in May and am looking for a CF position in an elementary school. I’m exploring all options, and my top priority is to ensure a solid experience for my CF. My resume is attached and I look forward to hearing from you soon to discuss this opportunity. Take away tip – Most social media sites allow you to identify yourself as a member and allows others who share in the same membership to view/communicate with each other. Even if you do not know a specific person you might be interviewing or working with in the future, your shared social media network can establish common ground. Use one of the most powerful communication tools you have to connect with future employers. Make Social Media Accounts a Positive Influence! Life is full of social media tools we use as a primary way of communicating with family, friends and classmates. Who can be surprised that it is also a primary way of communicating with employers? This ability to communicate with your future employer is an incredible opportunity to share who you are and what makes you happy. Use your online tools to create a positive well-rounded image! Show your professional curiosity, personal style, personality, interests, leadership, teamwork and volunteer activities to your best advantage. Here are our top 7 tips for your social media makeover to avoid common problems that might diminish your standing in the applicant pool. Make your online identity meet your future employer’s expectations. In some ways, your job search is not about you. It is about what your future employer is looking for when they hire and how well you can meet those needs. Your resume emphasizes how your education, experience, work ethic and interpersonal skills can meet the required job functions. When job hunting, your digital footprint is one tool you can use to communicate the same message. Think about the skills, qualities and interests that your ‘dream job’ employer might be looking for when they hire new staff and add to or edit your social media content with that in mind.Recent hiring manager surveys indicate that between 60% and - 93% of them check out a candidate’s social media and online information prior to making a job offer. All of the statistics presented here are sourced from recently published employment surveys, including CareerBuilder 2016 and Jobvite 2014 Social Media/Hiring Manager studies. Commit to fixing any unprofessional online image as much as possible. Although it might seem easier to just make all of your settings private and not take the time to groom this aspect of your life for your new professional career, this might not be the best option. Since the majority of employers are checking you out online, they might overlook it, but you have missed an opportunity to impress.According to the CareerBuilder survey, the majority of hiring managers want to see a candidate’s professional presence online. While most are not looking for negative information, the absence of any information might be a red flag that you have something to hide.More than 40% of the hiring managers said that if they are unable to find any information about an applicant online they will be less likely to consider them for a position. Seriously, do a Google search on yourself to see what a potential employer will find when they search for you. On the positive side, you might be happy to see that science fair article from high school, your classes’ volunteer day activities from the alumni magazine and your ASHA Poster Presentation. On the other hand you may be surprised to see your online rant that got picked up by the local newspaper or your small claims court spat with a former landlord.We advise deleting or adjusting any online items you have control over, working with others who have power over correcting or agreeing to delete any misinformation that you find, and considering other more drastic options sparingly. Remember, something like an arrest can be omitted but criminal convictions on your record will probably need to be disclosed to the licensing board and an employer at some point. 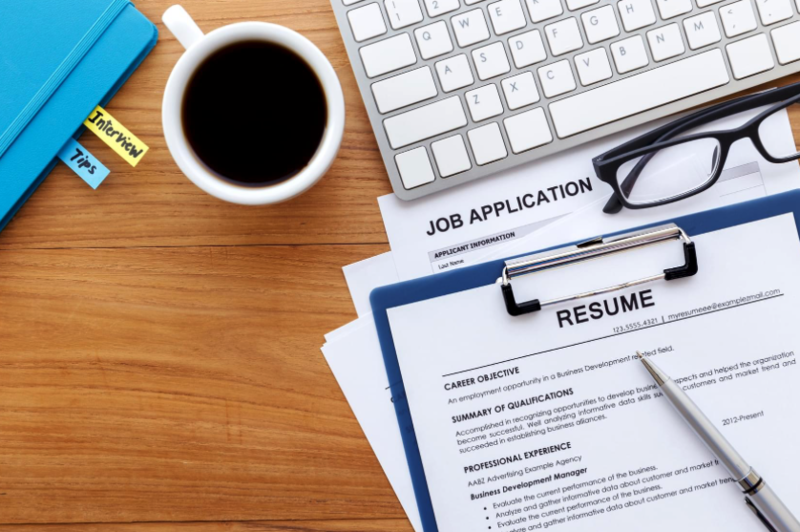 Whether it's Facebook, LinkedIn, Instagram, Pinterest, Google+, YouTube, Snap Chat, Glassdoor, or the myriad of other job search boards you utilize, make a conscious decision to add the details that enhance your image and help your job search. If it comes up in a Google search about you, take the time to make it as strong as you can and be consistent with your other online information. Remember to include your professional key words when appropriate, so employers looking for what you have to offer can find you, but don’t forget the impact of a profile photo, too!Studies show a smiling picture engages more people than a non-smiling one but any picture has a stronger positive impact than no picture. The exception to this is resumes, where employers are less likely to select the candidate with a photo on their resume over a candidate whose resume does not include a photo. Present a balanced, well-rounded picture of who you are and what you are capable of doing. Adding a well thought out and articulated response to a recent course, clinical experience or other professional event over the next few months will add professional depth to your usually lighthearted Facebook greetings. Include pictures of professors and classmates in your photos. Link, follow or include groups you participate in, organizations with information you find valuable and professionals you admire, especially those that share resources or professional information.Next week we will explore how to actively use your social media sites to actively support your job search process in detail! Consider Omitting the Controversial Issues. Everyone has a right to be politically active and share their personal beliefs and perhaps your political involvement is something that you want any future employer to know about you in advance. But be cautious and avoid negativity.Topics to avoid sharing on social media include negative comments about professors or classmates or former employers and co-workers, engaging in cyber bullying or trolling, personal sexual activity, illegal drug use and discriminatory comments. Proofread and correct your Facebook posts and other online comments. Poor communication skills is listed as a pet peeve by 66% of hiring managers. I can only assume this number is even higher in professions that rely on good written communication as a large component of the position.Proofreading your own writing is hard! Offer to help someone else with theirs if they help you with yours. Take away tip – Here are the cover photo sizes for some common social media sites. Help! I Need a Backup Plan! Things to consider adjusting when the job search just isn't going according to plan – Location, Clinical Setting and Compensation. Things to consider adjusting when the job search just isn't going according to plan. You've set your goals and established your priorities but the perfect job isn't forthcoming. None of your friends know of companies hiring and no suitable jobs are listed on internet job sites. Your phone is ringing off the hook and your email box is full of messages from recruiters with jobs you don't want in locations you don't want. Now what? Location can be a huge stumbling block for your job search plans. If you are geographically specific in a tight job market you may need to consider ALL options. Here are some details to keep in mind when assessing if the location will need to be the priority that you adjust. A nearby SLP University Program will have a huge impact on your clinical options and compensation. If there is a University Program in your target area, draw a 40-mile radius circle around of the school. Draw a 50-mile radius around a school that is in a more sparsely populated area. Inside the circle will be the most saturated job market. In some areas, there are two, three, five and even seven SLP programs with overlapping 40-50 mile radius circles. You will have more job options outside of these circled areas. Specialty clinical settings are usually based in areas with denser patient populations. The job market is stronger in these areas because, in addition to the most common SLP jobs available in Schools, Nursing Homes, and Home Health services that are in all geographic areas, the areas also draw people into the area to receive specialty services. There is less diversity of employers and job types in rural areas so you will almost always have a higher quantity of job options in the largest communities in your target area unless that is also where a University Program is located. Exceptions: Specialty skills may be hard for employers to find even in a tight job market, Specialty certifications, Bilingual SLPs, specific AAC device experience are all important to include in your resume along with all diagnosis you worked with. On-line resume submittals are often screened by a keyword search applicant tracking system before a human eye considers the best matches. Your resume must include the detailed words plus the preferred words for the available position in order to make the cut. If you are looking for a specific clinical setting and not finding it in your target job market you may end up compromising between either a clinical setting or geographic location. If you settle for something that is a clinical compromise you will have a harder time building the skill set that makes you competitive for the job you really want. If you compromise on location, you will strengthen your skills in your preferred clinical setting but will spend a year or more outside of your targeted geographic area. It’s a tough choice to make. Here are some details to keep in mind when assessing if the clinical setting of your CF job will need to be the priority that you adjust. Over 50% of all SLP jobs are in the schools and the majority of CFs obtain their CCCs in a school setting. Schools are everywhere and they are also one of the few settings where obtaining a clinical mentor is not usually a problem. It is not difficult to transition to a medical position after working in the schools for a year because it is such a common occurrence. State license and teacher certifications are different in every state! Some clinical settings have a harder time employing CF’s because the CF license is a restricted or provisional license in their state. There will be a tighter CF job market in these areas. Compare both the state license and teaching certificate requirements to see if there is a difference in the state in which you plan to work. It’s not about how easy or hard it is for you to get the license or certificate. It’s about how easily the employers in some clinical settings can meet the requirements of a CF-SLP. Niche specialty positions such as accent reduction or voice may be out of reach for a CF and require more than one strategic job step in order to eventually secure the dream position. Sometimes you can find positions that have a piece of the clinical component that you want. Often these types of positions can be found in school positions, but you can also find these type of positions in clinics, hospitals, and home health if you know how to look for them and negotiate that some of your caseloads will include these populations. Expect to dig deep and build your own professional resource network in these situations because there may not be a specialist available to help you with your work for your specialty caseload responsibilities. Exceptions: Specialty skills such as Bilingual Spanish, sign language, AAC, ABA, etc. can also open the door for you to gain more experience in other specialty clinical areas of interest. Use your in-demand strengths to leverage yourself into more specific opportunities. Sometimes, just being willing to work in an undesirable location is a sufficient strength to get more of the job you want clinically or to negotiate a higher compensation rate. Compensation varies between different geographic areas and clinical settings. It is sometimes hard to reconcile what you have set as your minimum acceptable wage and what is being offered, especially in some of the more desirable locations and clinical settings. Within clinical settings, the rate of pay is somewhat tied to the level of productivity that an employer can calculate. For example, a Home Health job may pay per visit and the employer is only paying for productive work hours. A SNF job may come with a productivity expectation of 85% or more. A larger Private Practice might book your appointments back to back to back. These tend to be the higher paying positions. Hospitals, smaller private practices, pediatric clinics, and schools tend to have a less stringent billable hour accountability structure and also generally pay less. Contract companies and other for-profit companies tend to pay higher wages than government and not-for-profit employers. Look at the bigger employment picture as you assess your expected salary expectations. Accurate salary information is hard to find and hard to compare because every employment structure has different tax and benefits implications. You can check salaries through a variety of places but they may not be very helpful. Using ‘average salaries’ for comparison means you are likely trying to compare your compensation offers to that of someone with 12-15 years of experience. Expect your CF offer to be lower than ‘average’ even if you can find something exactly for your specific geographic and clinical areas. Your benefits can be up to 40% of your compensation. If a company isn’t offering an employee status for tax savings and strong benefits, your compensation rate might be significantly less than you think! When employers pay for your benefit expenses and also pay a portion of your payroll taxes, you don't have to pay for them yourself. Only considering the payroll amount when comparing compensation is a costly mistake. Watch out for the game changers to know when you are trying to compare apples to bananas in your job offers. Here is some basic information regarding the three biggest game changers. Benefits add a lot to your bottom line over the course of the year so before you accept that hourly rate make sure you know what your benefits package will be. Benefits are usually tax-free plus they save you from having to pay for these items yourself out of your paycheck with after-tax dollars. Travel Status is a legally defined compensation structure under the IRS tax code. It allows you to claim certain expenses as a tax deduction and/or allows your employer to provide for certain expenses such as your housing on a tax-free basis. To qualify for Travel Status you must have and maintain a legal residence, accept a job that is not commutable from your legal residence and make a commitment to that job location for a period of less than one year. Find out more information about Travel Status by speaking with an accountant (not a tax preparer) and reading up about the requirements on the IRS website here and here before considering a position as a travel therapist. Exceptions: Some rural and urban areas realize that they need to pay an incentive salary in order to attract someone to the area. These areas will be where there are no nearby programs offering your degree and/or have a perception of other undesirable qualities such as poverty, crime rate, climate, etc. These areas pay higher wages for a reason, but they can also offer you exception opportunities! Don’t let what you’ve ‘heard’ keep you from checking them out. If you don’t know where these higher paying jobs are located, ask a contract company. We work across multiple states and know the areas where there are few applicants and employers are begging for more staff. That’s one of the reasons they use us! Take away tip: Sometimes you need to look at other aspects of the equation to make all the pieces balance. Consider these options and strategies to help maximize your available dollars. Follow our easy steps to a stress-free job search! Set your priorities before you send out your resume to get the job you want. Decide your priorities - what jobs, where, and for how much compensation - before you send out your resume. We're sharing this series of weekly job search activities to help you not just find a job, but to find the right job. You worked hard to get into your university program, worked hard to get through grad school and to pass your Praxis. You deserve to claim the rewards you earned with all of that work and effort. For the last few years your focus has been on getting in, getting through and getting out of grad school. Drilling down and absorbing everything SLP related. Now you have to learn how to network, interview, understand employment structures, employment contracts, insurance and benefits, tax deductions, license and certification requirements and more! And you thought you just needed a job! Identifying your priorities in a job search is an essential first step. Unless you identify where you want your career to go you will be overwhelmed with activities that may not move you forward in a way that best meets your needs. We want to help you identify your professional priorities and then navigate and understand the process employers use to select applicants so that you can confidently find the right job for you. Congratulations on all that you have achieved so far. You have chosen a great career and are among a select group of professionals who will have significant impact on individuals who receive your professional services while enjoying the security of stable employment with a wide spectrum of career options. So let's cover the basics. There are three primary components to identify in an SLP job search; clinical setting, geographic location and compensation. Only you can determine the priority balance for these career components. And those priorities are set by two competing approaches to your career: your brain and your heart. Your brain may be saying one option is the best way to pay off your big pile of student loans but your heart is saying you really want to work with children, which is usually not the highest paying job. There are exceptions within the field that may make your competing goals come into balance and we'll cover that information in future steps. For now, try to assign a percentage value to each of the three areas, clinical setting, geographic location and compensation. In this exercise, the total should equal 100%. New CF-SLP A: She needs to be in a specific geographic area. New CF-SLP B: He has a passion for working with children using AAC devices and would like to be near a major city. One lesson you should take away from this activity is that if you are geographically specific you probably need to consider all clinical settings. And if you are clinically specific you need to consider a larger geographic job search area. There are only so many CF jobs available and you want to make sure you get the one that best meets your priorities. There is no right or wrong answers and of course it's really difficult to get exactly everything you want in a first job, but this little exercise will help you narrow your job search focus and efforts in specific areas that move you forward in accordance with your priorities. Everyone is different. Your priorities and choices are your own. And your future employer should know, understand and be able to meet your needs. That means YOU need to know, understand and be able to articulate those needs in a professional job search process. Your objective here is to use your decisions regarding your career goal to set the foundation for your job search. As you consider these elements and plan your job search, the choices you make will influence how you develop your resume, how you search for job vacancies and how you interview. Use this information to choose the best format for your resume, the words you include to describe your clinical experience and interests and who you share your resume with. Use your priorities as the criteria when accepting and declining interviews. Your priorities affect everything from who you select for your references to which job offers you consider. Our best advice is to not skip the basic step of setting a goal for your CF job. So let's get started! We can't wait to hear where your choices take you and look forward to sharing the next step with you next week. Take away Tip - When applying for jobs that are not commutable from your home, do not include your address in your resume. Employers often have a bias in favor of local candidates who might stay in the job longer and have fewer onboarding logistics to manage. Next week we’ll go over developing a backup plan for those ‘just in case’ situations. View our Most Recent Tip!